What makes Salon Iris the one for you? Hundreds of Features & Reports Designed JUST FOR YOU! It comes in the right version for you! 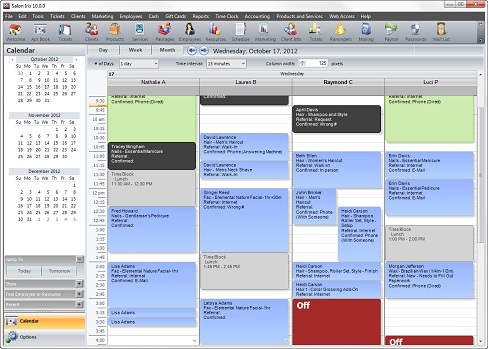 Salon Iris salon software has the most powerful and simple salon appointments database for management of your salon. Adding or editing salon appointments is simple. See your appointment management menu. Just click on the time slot on the appointment book and Salon Iris does the rest! 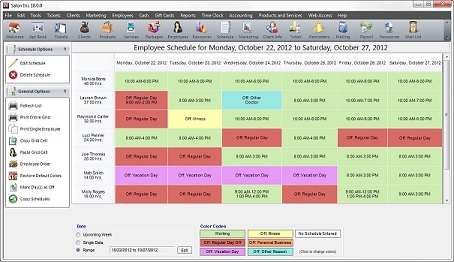 Customized color codes make it easy to quickly view when an employee is available to service a client. 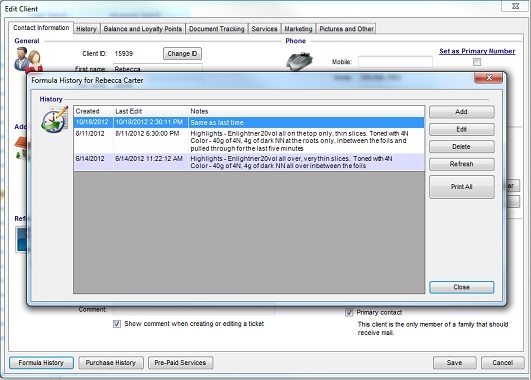 The Salon Iris salon software screen shots appointment management menu offers diverse, yet proficient salon options. Enter each employee's schedule of working hours for individual days and even set up a recurring schedule for the employee to record many days' schedule at a time. The Salon Iris Appointment Book reflects the employees' schedule by displaying what days and times they are working or unavailable. Additionally, employees can clock in and out using the Time Clock feature, and you can track the working hours for each employee in addition to the scheduled hours. If you are using the Payroll feature as well, you can import time clock hours into payroll to calculate hourly pay for each employee. 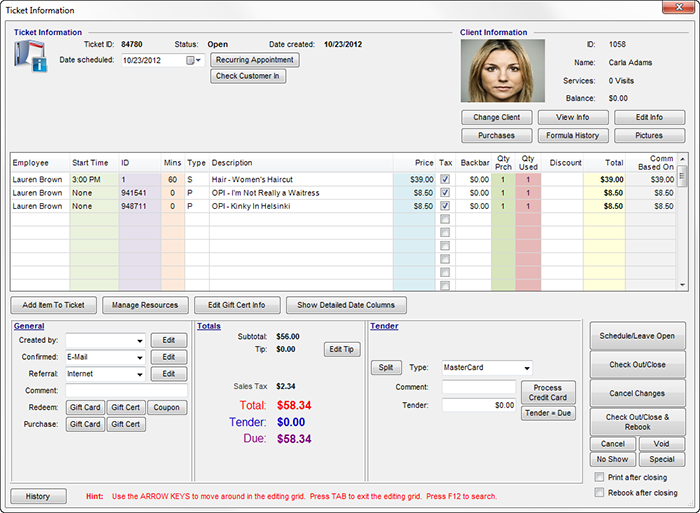 Salon Iris salon software allows you to create a detailed, custom client list, including pictures. All editions of Salon Iris software can store an unlimited number of clients in the database, so you will never run out of space! 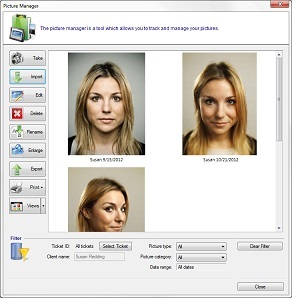 Learn about your clientele from your software! Managing your salon is easier with a contact database with all the important information you need about each of your clients. 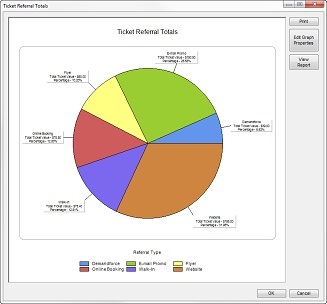 Salon Iris software also has built-in reports to display top spending clients, percent of clients that are retained by employees, new client lists, client referral types and many others! Each client has a complete purchase history profile which contains information about previous product and service sales to help you suggest items to clients during their visits. No-shows and cancellations are also tracked per client so you know who to follow up with, and special pop-up notes can be made for each client to give you an extra alert when creating or editing any appointment for the client. Salon Iris management software allows you to enter a list of services, prices, and descriptions that your business offers. 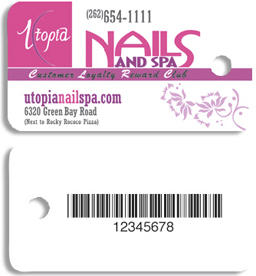 Scan barcodes to quickly sell products, add products or services to a ticket by looking up an item from an available list or entering a quick ID, and even handle pre-paid services so that clients can pay for a series of services in advance quickly and easily. 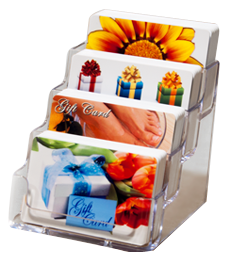 Provide a professional touch, free advertisement, and have immediate income when gift cards are sold. You can get custom designed and pre-designed gift cards that will integrate directly with Salon Iris to provide a quick and efficient way for your clients to pre-pay for products and services. After a gift card is purchased, it can be used on returning visits to pay for purchases. And unlike paper gift certificates, gift cards are durable and reusable, so your investment will last for many birthdays and holidays to come! Your clients can book and schedule an appointment in just a few minutes, and you will get a complete website that is fully customizable for your business, market to new clients, and give information about services that you offer. 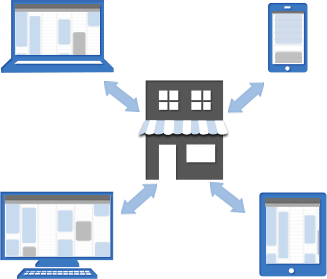 You can feature all your business info, including hours, service list, specials and employee. Unlimited custom webpages for flexible content and navigation. Easy styling with an intuitive "what you see is what you get" editor. Edit text, colors, photos, videos, fonts, and more right from the website. Customize your Facebook application to allow customers to easily book right from your Facebook page. Your appointment availability is automatically updated in real time, and new appointments will be shown as soon as they are scheduled. Check out our demo website to see what online booking can offer your salon. 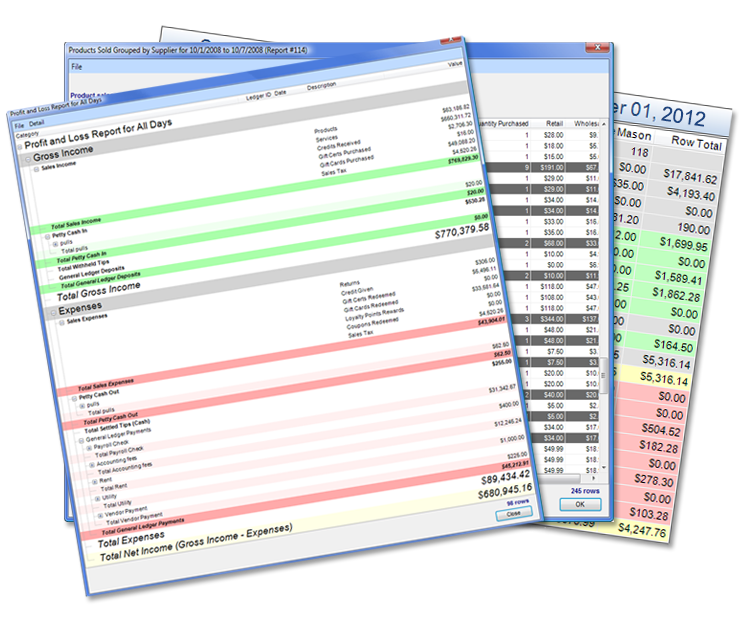 Salon Iris software includes over 200 built-in reports that will help you to get details about your sales, clients, products, and so much more! The built-in reports are easy-to-use and provide you with key details that will help you to run your business effectively. Most reports can be viewed in a simple grid as well as a full-color graph! You will be able to visually see all the information about your business in a variety of ways, and print the information to keep on record. Remote Access works with all current editions of Salon Iris. You can stay connected to your business no matter where you are. Access your appointments, client list, run reports and more from your home computer, laptop, tablet, or smartphone. Everything stays perfectly in sync, so everything you do while out of the salon is immediately updated in your business. unlimited access from anywhere additional charge of only $9/month per user.